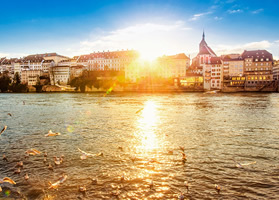 Cruise the Rhine River with the women of Olivia, starting in the extremely LGBTQ-friendly city of Amsterdam and ending in delightful Basel, Switzerland. 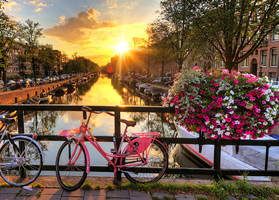 Experience fields of vividly-colored tulips in bloom and stroll along the canals learning about Amsterdam’s amazing history. Included tours in most ports ensure you see the best of the best as you immerse yourself in the rich local cultures. 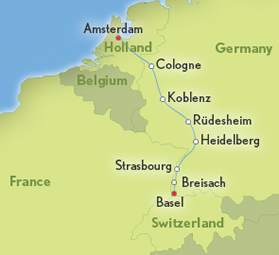 One of Europe’s most legendary rivers awaits you on this exciting journey along the Rhine River, which takes you across Germany—and touches in Holland, France, and Switzerland! 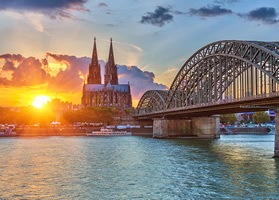 Cologne, Germany—a 2,000 year-old city known for its gothic architecture—will be an exciting stop with its famous twin-spired cathedral and Old Town with many shops, cafés, and taverns. While you’re there, why not try a locally-brewed Kölsch beer? Pass through the dramatic Rhine Gorge—the most beautiful stretch of the Rhine River where ancient castles stand on cliffs 400 feet above the water. And nearby, in the charming wine town of Rüdesheim, visit the unique Siegfried’s Mechanical Musical Instrument Museum to see the impressive collection of historical self-playing instruments. Continue your Rhine river cruise to Mainz for a guided walk and visit to the captivating Gutenberg Museum. 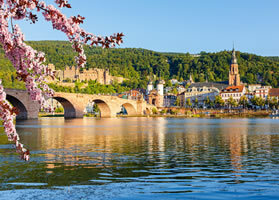 An excursion takes you to Heidelberg to visit the ruins of its red-walled castle towering magnificently over the city. In Strasbourg, France, you’ll be amazed by the red-sandstone gothic cathedral with ancient murals and fascinating astronomical clock. Also, stroll through the lovely La Petite France district with its quaint shops, delightful bistros, and peaceful waterfront promenade. Before the end of your European river cruise vacation, stop in Breisach, Germany, the gateway to Germany’s Black Forest—an area of unrivaled natural beauty—best known for Black Forest ham, cherry cake, and the cuckoo clock. 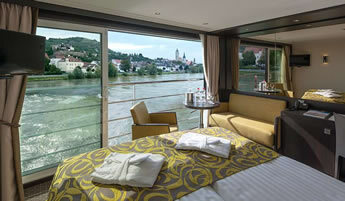 Part of Avalon's cutting-edge fleet of Suite Ships, the Avalon Impression came onto the river cruising scene with a bang. This gorgeous ship features two full decks of Panorama Suites with Wall-to-Wall Panoramic Windows that transform the living space into a unique Open-Air Balcony. With 200 square feet, Panorama Suites are more than 30% larger than the industry standard, affording you the incomparable opportunity to wake each morning facing the splendid passing scenery. 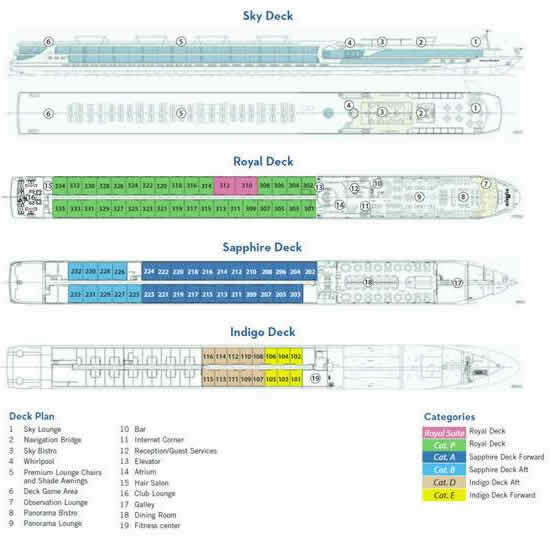 Onboard amenities include an alternative light dining option in the Panorama Bistro, an expanded fitness center, complimentary Wi-Fi access, and a spacious Sky Deck with premium lounge chairs, whirlpool, and light al fresco lunches at the Sky Bistro on the Sky Deck. Welcome to Amsterdam! 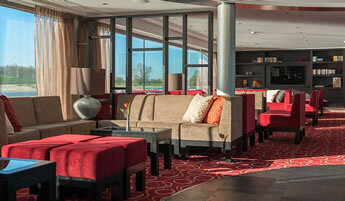 The capital of The Netherlands is sophisticated and modern, with a rich and fascinating history. The works of famous Dutch masters can be seen in world-renowned museums such as the Rijksmuseum or the Van Gogh. At approximately 4 pm, board your river cruise vessel and meet your Olivia staff and ship’s crew at a welcome reception with dinner. Note: Guests must be on board by 5 pm. There is no better way to see the city than by canal boat, cruising through the elegant grachten-lined canals with stately homes dating back to Amsterdam’s “Golden Age.” There’s free time in the afternoon to explore on your own, or enjoy an option tour. 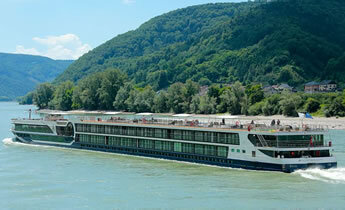 Afterward, your river cruise vessel sets sail for Cologne. 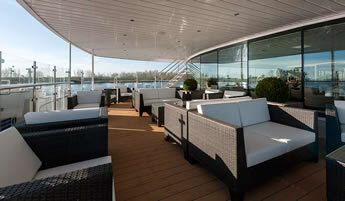 Today enjoy a peaceful morning of cruising before reaching gay-friendly Cologne in the afternoon. Cologne is one of Germany’s largest cities, with a river skyline dominated by the soaring twin spires of its magnificent gothic cathedral. In 2010, it was the site of the Gay Games. The Germano-Roman Museum located next to the cathedral is a must for history buffs! Try a Kölsch in one of the many beer taverns or shop for a bottle of “4711,” the original eau de cologne. Choose between and included Guided City Walk or Jewish Heritage Walk. Situated at the confluence of the Rhine and Mosselle Rivers, 2,000-year-old Koblenz is the cultural and business center of the Middle Rhine region. 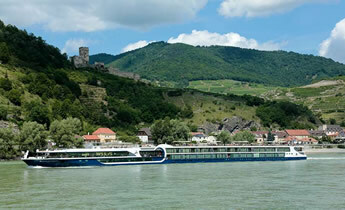 The dramatic Rhine Gorge is the most beautiful stretch of river. Pass the legendary rock of the Lorelei, where sweet songs of local beauties lured enchanted sailors to their doom. Here, join a local guide for a walking tour of the city that reveals an eventful past through its castles, fortress walks, towers, squares, and monuments. In Rüdesheim, quintessential Rhine Valley wine town, Siegfried’s Mechanical Musical Museum is a real surprise! 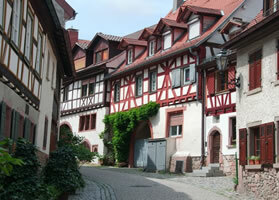 Enjoy the special “Rudensheim coffee” or wine tasting, then explore the Drosselgasse and pick up some souvenirs. Included museum and walking tour. Strategically located at the confluence of the Rhine and Main Rivers is Mainz, with “civilized” origins dating back to around 38 BC. Today, this is Germany’s largest and most important wine market. Join your Local Guide for a guided walk through the Altstadt (Old Town) with its many intriguing shops and the whimsical Fastnachtsbrunnen (Carnival Fountain) on the Schillerplatz, a tribute to the jesters at the city’s annual Carnival celebration. Gutenberg, father of modern printing, was born here—and you’ll visit the captivating Gutenberg Museum. After lunch, travel to Heidelberg, home to the oldest university in Germany. With a Local Guide, visit the imposing ruins of Heidelberg Castle, towering magnificently over the city and among the most important Renaissance structures north of the Alps. You’ll also see the famed Great Vat, the “World’s Largest Wine Barrel.” At nearly 23 feet high and 28 feet wide, the cask holds over 58,000 gallons of wine and has a dance floor built on top of it! 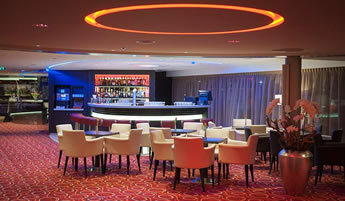 Ask us about the most delicious hot chocolate at the Illes Café! 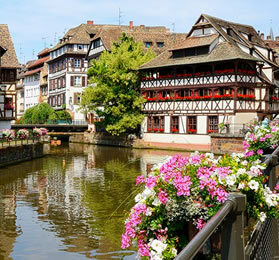 Situated on the border of France and Germany, Strasbourg blends the cultures of both countries in a delightful way. 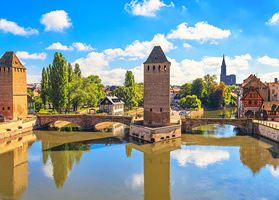 As capital of the Alsace region and seat of the Council of Europe and European Parliament, it is without a doubt an important city that manages to retain its historic charm. On your guided sightseeing tour, visit the monumental red-sandstone Gothic Cathedral with its ancient murals, stained-glass windows, and fascinating astronomical clock, as well as the magical La Petite France district, home to half-timber houses, quaint shops, inviting bistros, and a waterfront promenade. Also spend time exploring Place Kléber, a large historic square in the heart of the city, and Place Gutenberg in the heart of medieval Strasbourg, which features a statue of the inventor of the printing press. 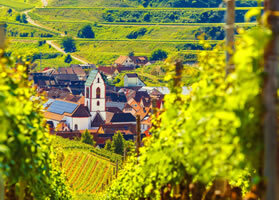 An optional excursion into Alsace wine country is available today. 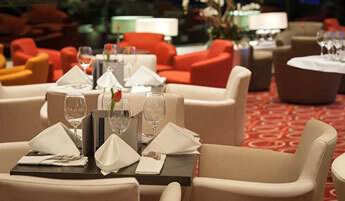 After dinner, enjoy an onboard woodcarving demonstration. Included canal cruise and walking tour of Le Petit France district. Located at the foot of Kaiserstuhl Mountain on the French-German border, Breisach is the gateway to Germany’s Black Forest region, an area of unrivaled natural beauty with its forests of thick pine trees. The area got its name because the forests were so dense that local residents described them as black. Surely the most well-known products from this region are Black Forest ham, Black Forest cherry cake and cuckoo clocks. You may opt for an included visit to the workshop of a local woodcarver who produces clocks and other carvings, or to the open-air Museum of Vogtsbauernhof to see how life was lived in this area centuries ago. 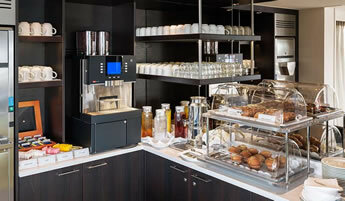 Your vacation ends with breakfast this morning. Departure flights should not leave Zürich Airport before 11 am. 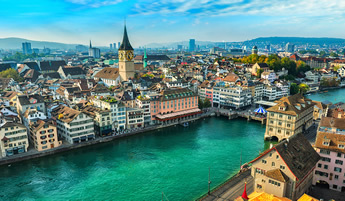 Transfer to Zürich airport included, or continue with us on our 2- or 3-night post trip to Zurich! 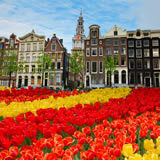 We will be offering vacation stretchers in Amsterdam and Zurich. Information on these will be available approximately 9-11 months in advance of the trip. 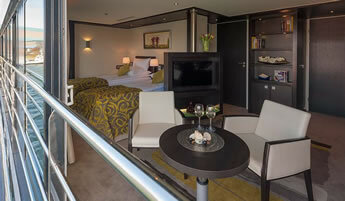 Rates: Prices are per person based on double occupancy. Pricing does not include airfare, insurance, fuel surcharge or NDA of $499 per person (subject to change). Early bird prices valid until October 15, 2019.